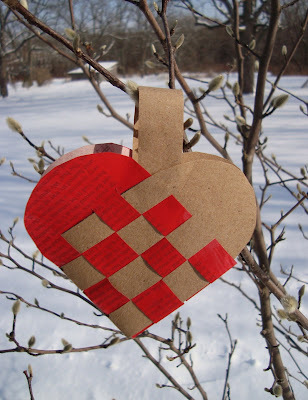 Woven heart baskets are a classic Valentine craft. You probably made them when you were little. There is a reason for their longevity: they're super easy,really fun, and can be made with whatever you have on hand. I needed a refresher course and found it in my classic craft book from my Grandmother's nursery school. Yes, this is a vintage craft with a twist. I wove an assortment of unexpected materials together... you're welcome to stick with standard red and pink construction paper, but I bet you can come up with some fabulous and innovative ideas. Here is a little gallery to click on, followed by an easy tutorial. * For fabric: iron to freezer paper before you cut out. This adds structure and reduces fraying from the pretty raw edges. Don't be scared of the template. You can eyeball it. The most important measurements are of the two pieces to be woven: they must be identical. Begin by choosing and cutting your materials. I liked having a lot cut at once so that I could mix and match as I made them. 1. 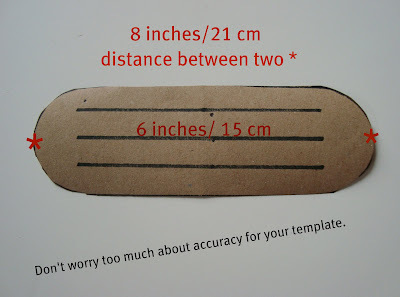 Fold rounded rectangle in half and mark where you will make your three cuts. 3. Weave in and out of the loops. Open the loops to feed the alternate side through and vise versa. Once you are doing it, it should make perfect sense. Let me know if you'd like more of an explanation, if after trying it you're still not certain. 4. Glue or tape a coordinating strip of paper (I used twill tape for the fabric ones) for hanging. Don't for get the best part: these can be filled with messages and treats. This would be sweet hanging by a bedside for a morning surprise! The message in this one: "You mean the world to me!" Here's a little sneak peek at something I'm working on for next week. Beautiful! I like the map ones best, though they are all very sweet. Thank you for another thoughtful tutorial and creative project. Great idea. Thanks especially for posting it w/ enough time for us to get our act together. I enjoy your blog a lot. I link to it from Sew Liberated, although I'm not sure how I found her blog. I'm a mom w/ a toddler in California. This one takes me back Maya...super cute. I love the look of that book - I bet it's filled with treasures. WAW, Maya! These are so cool! I know what I'll be doing this weekend!! I'm sure my girls will love this project!! It does look like we've been thinking along the same lines - or should I say thread ? ;) - this week. I bought some really nice newspaper woven baskets the other day and as I was putting aside a stack of newspapers - for your stamped newspaper hearts! - I started thinking that maybe I could try to weave my very own baskets... And there you go!! With a tutorial and everything!! Just perfect! Too bad I can't find freezer paper around here... but I might try with some leftover iron-on transfer paper. I'd better start working now, so I have some time left for some fun crafting activities with my girls this weekend! Have a nice weekend and thanks again, Maya! Lovely! 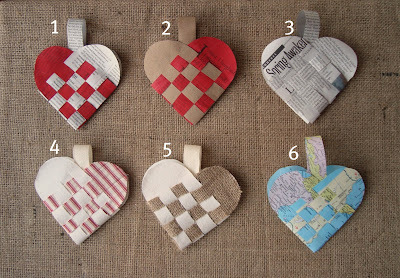 These woven hearts are so nice; a great idea, i have never seen it before. Thank you! Oh how fun! I am now on the hunt for a fun Valentine idea for Pajama Girl to do for school chums. Since there is only 11 in her class we can take on something like these woven hearts without too much kindergartener burn out! I've always loved those woven hearts. I haven't done them in ages. I wonder if my oldest would want to try her hand at making them. I love hearts any time of the year so this is like maya*made paradise for me! I really like how the fabric ones look and am excited to see about those felt hearts next week. Handily I have some nice red felt left over from Christmas crafts! Adorable! Do you mind if I link to them on Glitter Mommies (fun with kids blog)? I especially love it with the vintage map. You could always scan and copy your destinations if you didn't want to use the real maps. That way the world is the limit. Or maybe the moon ( you send me to the moon) or ocean surveys ( the sea of love) . Okay I am having too much fun and it isn't even 7am yet. Those are so "Swedish"...you see them all over the place here but for Christmas on the trees...I love what you have done with them...using the maps and newspaper! Love that old idea book...I also have some of my mom's stuff she used in El Salvador working for the American Friends Service Committee (pre-PeaceCorps). Nothing like old ideas...very cool! Love your creativity! We're getting started on our Valentine's stuff this weekend! Thank you so much for the ideas and directions! I can't wait to try these out with my son this weekend!!! I have that same book and it is just the GREATEST! I just can't get over that book! TOO CUTE! Beautiful! I love no. 1, really pretty. This is the first time I've read your blog. It's such a lovely & inspiring place. I'll be back! Maya, your projects are so sweet and lovely. 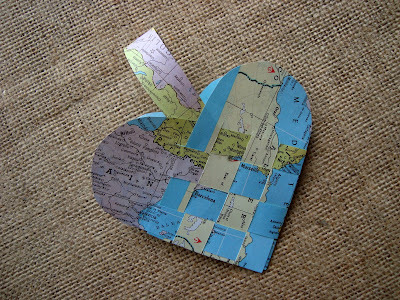 I love the hearts you made with fabric and ticking, as well as the vintage map! All of your suggestions, such as using a menu from the first date with the loved one, are romantic and so sentimental. Thank you for the great ideas and splendid tutorial!! Maya.....how inspiring! I am so inspired by you my friend! Wow. These are beautiful and so very sweet. Have a wonderful weekend my dear! Love them! I will be making these with my kids soon. These are really awesome, Maya. Thanks for all of your inspiration! I honestly love these! I think the map one might be my very most favorite though! I'll be back for your giveaway! I love the woven hearts! 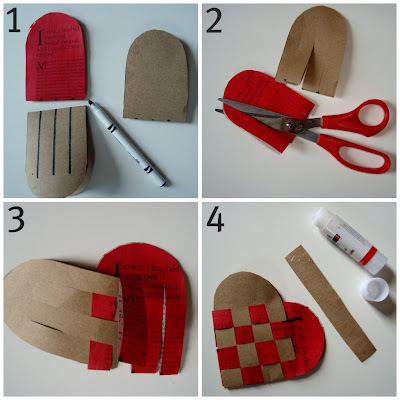 Maybe we'll do these for my son's valentines for preschool... great idea! 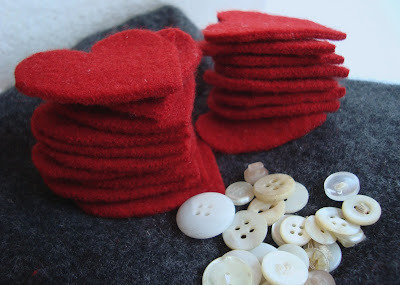 Can't wait to see what you do with those felt hearts and buttons! I love the woven hearts , they are so beautiful . Aww, I totally remember doing these when I was younger. So much fun! I love your updates and suggestions, the map idea is so much fun! I'll be linking. sympa de faire le tuto! I made some of these for Christmas. But I love the materials you are using -- and I think they're even nicer for Valentine's. Very Sweet- I will make many! But I REALLY want to comment on the book- I had that book when I was little! 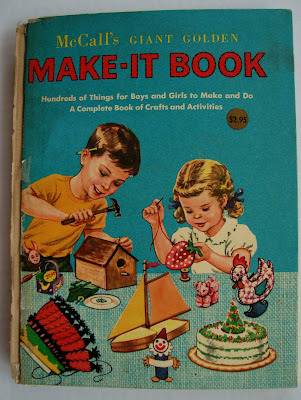 (making me 'vintage') I have often credited that book with being the catalyst for my love of making things. Thank you for posting that pic! so cute. my kids have been making those with paper. now we will have to try with fabric. Wonderful! I love all the combinations you've made. I don't ever remember making these, so it's new for me. Thanks for for the directions, I can't wait to try them. I found you via One Pretty Thing, and I'm so glad! 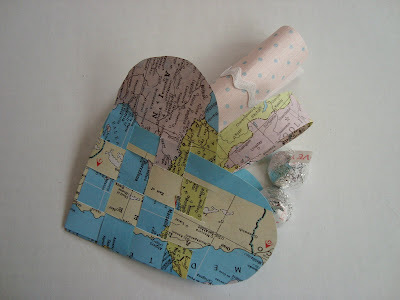 I have always wanted to know how to make these hearts. Thank you! These are too cute -- I am making them with my 6th grade math students tomorrow and having them measure to the nearest millimeter. Great idea, thanks! LOVE these little woven hearts!!! I am missing something here - how does it end up being a little pouch? Tisha, you are the second person to ask, and I just looked back over my directions. I thought my picture was clear... but it wasn't! Please try weaving in and out of the loops that each folded shape makes. This will create a basket and lock it in place. If you just weave it in and out (but not through the loops, no basket and they will slip out of position. Sorry if this was frustrating! OK the light bulb finally went off! I am an elementary art teacher and would see this being very difficult to teach. I have a hard enough time getting the over under concept across with just flat paper. Thanks for the idea and the response. I should do a teacher workshop on them!! Yeah! glad you got it, but sorry it was challenging. I did them with my four year old, and although I held the loops open and helped guide her ... she really did a lot of it on her own. I think this works best with assistance for younger children, but shouldn't be too hard for elementary age to do independently, if my son is (ten) is any gauge. That's a great idea. Thank you for sharing how to make them! I just made one of these for my husband for Valentine's day and posted it on my blog, with a link back here. Thanks for a great project that didn't cost me anything! Just wanted to let you know I tried to make one out of foam but it was really hard because of the thickness of material. I will try to make it out of heavy construction paper instead. I wanted to do this activity with my 6 year old niece and the foam would be too frustrating for her. I love these woven hearts! Still have the very same book, made them as a child, and then for my son's preschool class - good times. Am enjoying listening to you chat with Jennifer at Craftsanity as I'm paging through your blog. Loads of inspiration here - keep up the great work. I love these! I may make some for my hubby since I'm still thinking about what I want to do for him. thanks. Just made a batch of these last night. Fabulous for the last minute because they are so quick and easy. Thanks for the post, Maya! I have included them in a big list of tutorials for wrapping and decorating. Thanks for sharing! !...and for your beautiful blog. What are the measurements for the width? I needed a valentine project and wanted something different. There are two age levels. I will be able to do a large heart for little fingers, and do a card with the small hearts for the older kids. Thank you so much for the wonderful idea and inspiration .